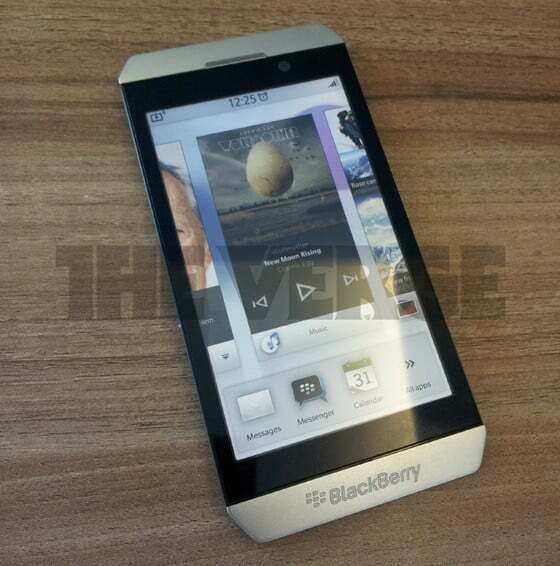 If this is what the next BlackBerry will look like then we are already getting excited. The folks over at The Verge were given a picture of what is believed to be the first BlackBerry phone with the company’s newest operating system BBX. The device pictured is said to be codenamed “London”, which of course is subject to change. The phone is rumored to be scheduled for a June 2012 release, with no hints at a possible carrier at this time. If the tipster is to believed the London will be equipped with a dual-core processor, 1GB of ram, 8-megapixal rear camera, and a 2-megapixal front camera. Blackberry is fitting all of this into a form factor that is said to be thinner than an iPhone, and should have a screen size of around 4 inches. The operating system displayed looks like the recently announced BBX, which is based on the QNX software that runs the BlackBerry PlayBook. As there is only just a single image available we won’t know for sure what software is running on there. The device picture looks like there are a few design queues taken from the Porsche designed Blackberry, which is a great looking device. The phone pictured is said to be a dummy device, so it is a non-functional phone that might be put in a store for display purposes. The fact that Blackberry is making dummy units would imply that they are nearly completed with the phone, which would be very exciting. That being said, if RIM already had a new BBX phone designed and modeled we think it would have showed off the device at BlackBerry DevCon when itannounced BBX. We have a long time to wait and find out more info between now and June. That being said the phone looks great, if it is real it might be able to convert some smartphone users back to BlackBerry.